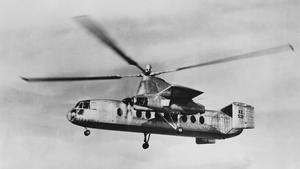 The British company Fairey had built several compound helicopters in the 1940s. One of these was modified with tip jets as the Jet Gyrodyne in 1953. 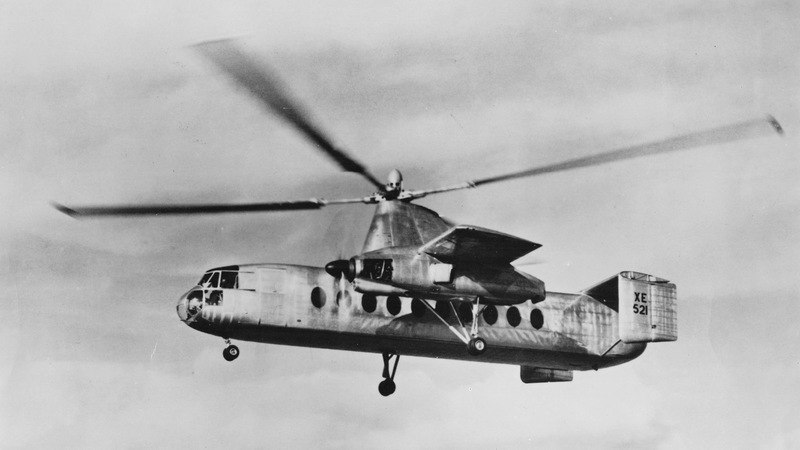 Based on this data, Fairey designed the 33,000 lb Rotodyne, a 40 passenger transport powered by two 2,800 shp Napier Eland 3 turbine engines. The fuselage was 59 ft long with nearly 3,300 cubic feet of internal volume, ending in rear clamshell loading doors. 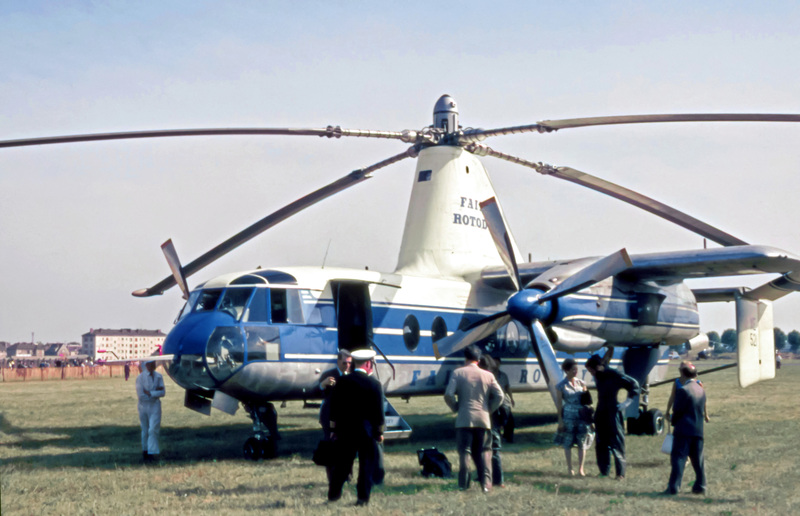 The 60 ft diameter four-bladed rotor was rotated by tip-jets in vertical flight and autorotated in cruise, providing about half of the aerodynamic lift. 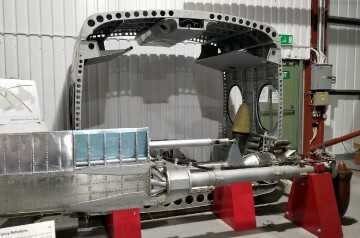 During transition, the engine power was transferred by hydraulic clutches to two four-bladed tractor propellers mid-mounted on the 46 ft wide wings. In hover and forward flight, yaw was controlled by differential propeller pitch, while pitch and roll were produced by the cyclic rotor pitch. Aerodynamic surfaces augmented control in forward flight. First flight in helicopter mode was on 6 November 1957. 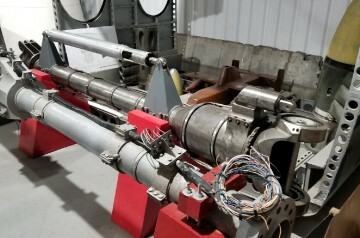 The first transitions were begun in April 1958, with problems making satisfactory tip jet relights at altitude being solved by that October. 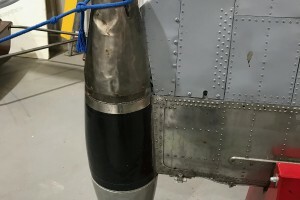 Tip jet noise was extremely unpleasant, driving a significantly modified production version with lower pressure tip jets. Despite apparent commercial interest, Fairey was taken over by Westland, causing the program to fizzle out in about 1962. 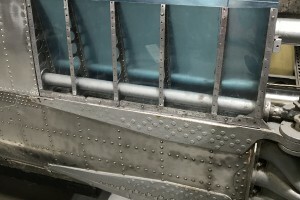 Flap hinge offset = 0.0444R. 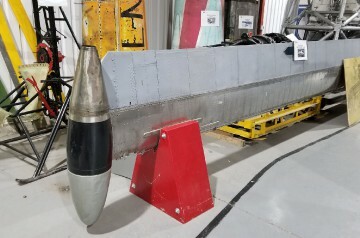 Blades have NACA 0015 airfoil section. RPM is the value in hover. 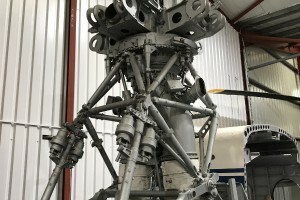 Resources related to the Rotodyne , provided by the Vertical Flight Society. Resources related to the Rotodyne , provided by public sources across the internet.